Amidst the many tombstones in a shady corner of Edgewood Cemetery in Ashtabula, Ohio is a very simple thick slab of granite, about the size of one of those washboards our mothers and grandmothers used to hand wash items before washing machines were invented. Inscribed on this granite in very large letters, as simple as the stone itself is the word “AITI”. which means mother in Finnish. It is the resting place of my great grandmother1, Susanna Karhu (Klemola) who had immigrated to the United States in 1896. Susanna was born in Waara, Finland in 1854. In their home country in 1876 at the age of twenty-two Sanna married Johan Karhu. Over time they raised a family of eight children. 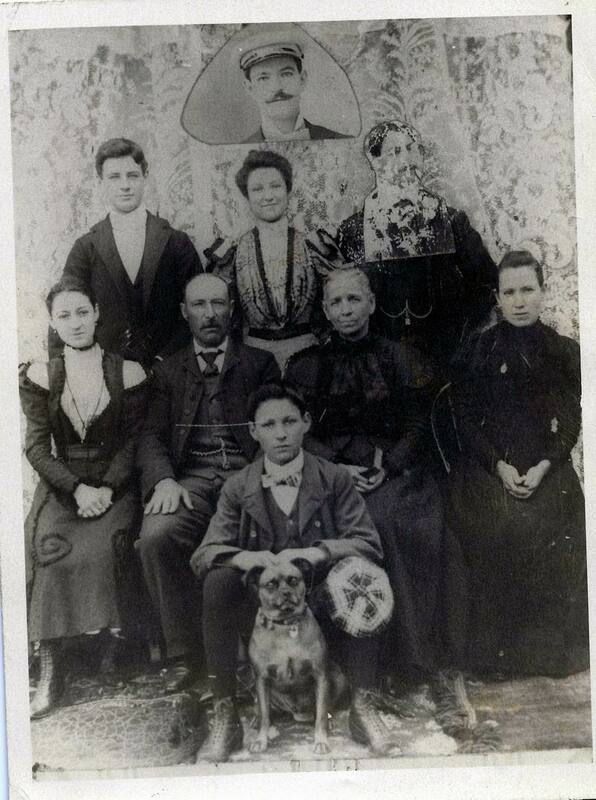 In 1893 Johan seized the opportunity to immigrate to the United States. He left his family in Finland and made his way to Ashtabula, Ohio, a port city on Lake Erie, where he worked on the docks and lived in the area of Ashtabula Harbor. At that time the port was thriving with constant activity. Large flat boats and barges loaded with coal and iron ore were sailing up and down the Great Lakes. These were prosperous times. New immigrants were eager to earn a decent wage. Once settled, Johan sent for his family. In 1896 Susanna ( Sanna), at the age of forty-two along with her three youngest children, Ida, Jaako, and Lisa set sail by way of Hanko, Finland.2. They boarded the S.S. Cunard ship ‘Lucania’ in Liverpool, England en route to America. Ellis Island was their port of destination in America arriving there on the 30th of May 1896, and continuing on to Ohio. Very little is known about Sanna. We do know that her two oldest children chose to remain in Finland. It must have been heart wrenching to know that she would be leaving behind these children and two of her babies’ graves. She was a housewife and at the time of her death August 18th 1929. She was 75 years old and among the oldest of the Finnish residents of Ashtabula Harbor having lived there over 30 years. Johan died in 1948. Where he is buried is still a mystery? after arriving in the United States. Ida, my grandmother appears to be about fifteen or sixteen. are surrounded by their children, grandchildren and great-grand children. 1. “Ohio Deaths, 1908-1953,” database with images,FamilySearch(https://familysearch.org/ark:/61903/1:1:X8PB-TC9 : 8 December 2014), Sanna Karhu, 18 Aug 1929; citing Ashtabula, Ashtabula, Ohio, reference fn 50528; FHL microfilm 1,991,908. Portrait of a Scandal: the Abortion Trial of Robert Notman, by Elaine Kalman Naves, is many things: a non-fiction courtroom page-turner, a story about illicit love, a tale of Scottish immigrant families in mid-19th century Montreal, and an exploration of some of the social customs and beliefs of the times. The fact that the book describes abortion practices and life in Kingston Penitentiary makes it all the grittier, while the high-profile identity of the main individual — the younger brother of society photographer William Notman — makes the details all the juicier. I wanted to learn more about life in 19th century Montreal, home to several of my ancestors. But this real-life story hooked me within a few pages, with the mysterious death of a young physician, Dr. Patton. I won’t be spoiling the book by revealing that Patton committed suicide because he mistakenly believed his patient, a student named Margaret Galbraith, had died as a result of the abortion he performed on her. Her lover, Robert Notman, was charged with procuring the abortion. The book is full of strong individuals, from the young woman whose hopes of becoming a teacher were doomed the minute she fell for Robert, to the lawyers who argued the case with dramatic flourishes. Their story is in excellent hands. Author Elaine Kalman Naves is an award-winning author, having already written a memoir about her own family, a book about Montreal writers and numerous articles for The Gazette. 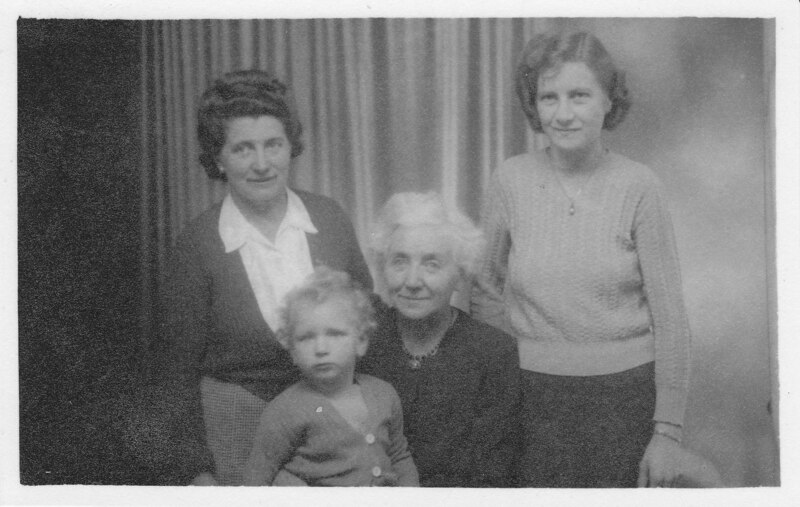 Many family historians would relate to Naves’ research process, from her frustration with the red tape she encountered at the McGill University archives to her pleasure following Margaret’s footsteps back to the shores of Loch Lomond in Scotland. Much of the material has been culled from sources familiar to genealogists, including newspaper articles, family papers and city directories. Naves has brought these 150-year-old sources together in a way that makes sense to modern readers. And despite only having fragments of information about Robert’s and Margaret’s lives, she has succeeded in bringing these people back to life. The bibliographic essay at the end of the book is also worth a look. Two of Naves’ favourite sources, Call Back Yesterdays by Edgar Andrew Collard, and Montreal: Island City of the St. Lawrence by Kathleen Jenkins, are probably on many Montrealers’ bookshelves, while the Dictionary of Canadian Biography Online is only a Google search away. Elaine Kalman Naves. Portrait of a Scandal: the Abortion Trial of Robert Notman. Montreal: Vehicule Press, 2013. A sense of dread enveloped me on hearing David’s words: “Paige is the first of our generation with Alzheimer’s.” David and Paige are my cousins, the sons of my mother’s eldest sister Madge. Alzheimer’s has long held a dark grip on my family. Madge died young as did her brother Clark. The remaining five siblings lived to seventy and beyond and all died with Alzheimer’s. Family clusters like this are unusual, my doctor assures me, and likely linked to something in the environment. The Willetts were born and raised on a farm in the Gaspe. Perhaps the trigger was something like drinking unpasteurized milk, my doctor suggested. Good, I’m a city girl and have always consumed pasteurized milk. But wasn’t that also true of Paige? I was witness to the slow progression of the disease in my two aunts and my mother. Violet was the first to be moved to a nursing home when her sister Kathleen could no longer care for her. Eventually she appeared to have forgotten everything, even how to eat. She died when a feeding tube perforated her throat. Kathleen was next. Frequently she tried to escape her home. Once she was found wandering miles away in a seedy section of the city. Someone drove her to the address on a letter in her purse, her old apartment. The new tenant invited her in to wait while the police searched their missing people’s files. Evidently the two women had a lovely afternoon chatting about their world travels, the tenant seemingly unaware of my aunt’s dementia. Social skills are said to be the last to disappear. Kathleen died of pneumonia, “the old people’s friend” my mother called it. Years later it was difficult for me to give my consent for mum to have a pneumonia vaccine. My mother’s Alzheimer’s accelerated rapidly following my father’s death. For a while she was aware of her confusion struggled to regain control. She railed against going to a home and accused me of kicking her out of her house. “Take me home” she would cry again and again. “That’s where my umbrella is. And my memory.” In the end, she forgot who I was and that she was ever angry with me. Time and memory became short circuited. She searched for her own mother in the rooms of the home asking constantly why she hadn’t come to visit her. My mother died peacefully at the age of ninety-four. By that time she too would not eat or drink and her words made no sense. But Alzheimer’s treatment had advanced. There was no force feeding, just gentle care and comfort from family and staff in her own room and in her own bed with soft music in the background. We no longer prolong the dying of Alzheimer’s patients but travel with our loved ones on their final journal. I held my mother’s hand as she took her last breath. A few years earlier my husband and I had emptied mum’s house and put it on the market. I’m still haunted by the image of the empty boxes we found stored in the basement: big boxes and small boxes, cardboard boxes and boxes covered in velvet, blue Birks boxes and boxes from the St. Hubert Barbeque. The boxes were the remainders of a lifetime of experiences. But the boxes were empty, a very powerful metaphor for the effects of Alzheimer’s. Today I am healthy and my memory boxes are full. So I write of memories, my own memories and the stories of my family that I have researched. If one day my memories are lost, my boxes will hold the record. My good friend Joel Bergeron’s grand-father moved to Temiscamingue early in the 20th century. Their descendants still meet annually at their cousin’s farm. The most beautiful tree grows on this farm. It’s painted on the side of the barn; its trunk has their grand-parents’ names at the base. 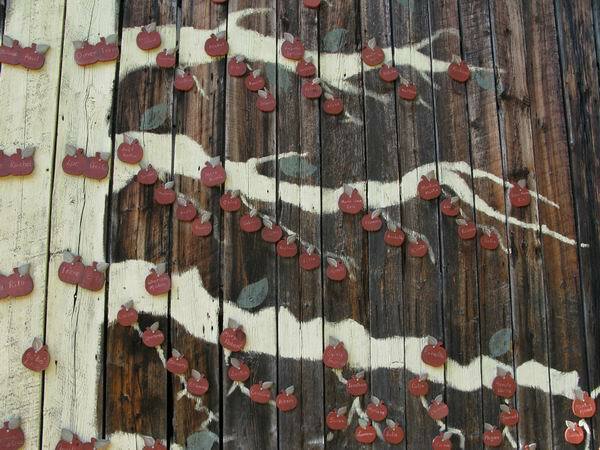 Wooden apples sit at the base of the main branches: each pair of apples represents a couple and another branch on the tree. Along each branch sits an apple for each child and his or her spouse. From each of these grows a smaller stem that in turn holds apples for each of their kids. Every year, the entire family comes to the farm from Ontario, Quebec, where-ever they live… to feed that tree with joy. Un arbre généalogique pleine grandeur! C’est celui des Bergeron qu’on retrouve sur la grange d’un cousin. Les grand-parents se sont installés au Témiscamingue au début du 20e siècle. Leurs noms sont à la base du tronc. A chaque embranchement, deux pomme pour un de leurs enfants avec son conjoint. La branche qui y pousse, contient les pommes des enfants de ceux-ci, et les petites branches, de leurs petits enfants. Et toute cette famille se réuni chez ce cousin, quelques jours, chaque année, parce que la famille, ça se cultive!